I saw several posts of bloggers comparing their online selves to their "real" selves last week and it had me thinking. Am I the same person on both sides of the screen? For the most part in this space I am 100% transparent. I share with you if I was hungover as hell or even if I'm having lady parts or bathroom troubles. I mean how much more real can I get? However, I still I think there is a slight gap in that parallel between Online Me and Real Life Me. So today I'm going to share those minor differences. 2 | Online Me on Cooking - I'm a badass healthy cook and I cook 5 nights a week and share rad recipes all the time! vs. Real Life Me on Cooking - where's the nearest take and bake place? 5 | Online Me on Blogging - I totally know what I'm doing and I'm bettering my blog by taking webinars, engaging in social media, writing spectacular material and doing all the cool things like drinking coffee. 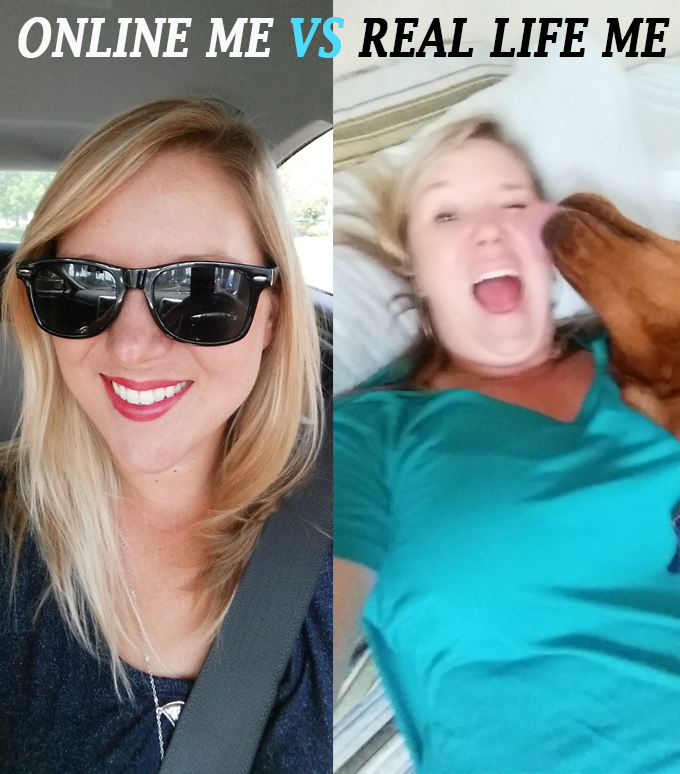 vs. Real Life me on Blogging - what the hell am I doing???? Tell me, are you the same person online and in real life? haha! i love this. for me, what you see online is what you get in person. most of my selfies are me looking like a potato (that's my way of saying zero makeup and usually looking like i rolled out of bed) or in workout gear because i pretty much live at the gym. Girl I love you so much for this post. You made my Monday morning. I seriously am inspired by how real you are here and it isn't all Pinterest perfect (see lady part probz). Your authenticity completely shines through and that's why I'm so glad I found you and your blog! Me...I could do a better job of just being like..here's me #BecauseImKeepingItReal. Hahaha I am like this a little bit. I don't really even take pictures of myself without being in real clothes and make up....unless they are sweaty work out selfies. Which I have shared online before hahaha. I like this post idea, very unique. I think we all polish up a bit for the blog, but most of the bloggers I follow are real too. I stopped reading and being friends with someone [for many reasons, ie DRAMA] and now just laugh at how FAKE she is in blogland. She complains about everything, but on the blog everything is roses and 'i'll pray for you'. That stuff drives me nuts. I love this so much! 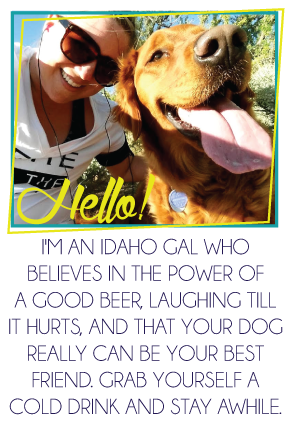 I feel like I'm pretty much myself on the blog as well - crazy dog lady and all! I love this post and I am so doing it too! You and I are a lot alike my friend! This is totally relatable! I am the exact same way. I try to be authentic but it's human nature to want to look good when it's going to be out on the internet for all to see! I love this post! It's so nice to see bloggers that are genuine and admit when they aren't always "perfect." Because, I mean who really is?! I adore this, and I love the realness you put behind it. I try to be genuine but I'm sure make up gets added a little more than a normal day. I hope however that my personality always shines through the same as it would everyday. Yours definitely seems to, and I love it! LOLOL I absolutely love this post! Such a cool idea. I love this! I totally identify with the personality part. My personality online and in person are so different just because I'm such an introvert! I'm definitely all bubbly and happy and sometimes loud and crazy with people I know, but with people I don't know? Forget it. But online I'm more comfortable I guess so I babble forever in my posts and comment on everything and just 'talk' a lot! Haha- so funny!!! I feel like what I share online is definitely the real me however, only a tiny part of me. A lot of family (and unfortunately a coworker or two) have found my blog over the years and i know there is just stuff I can't share that I wish I could lol! This was hilarious! I can relate to #1 & #3, haha. I tend to hold back on some things on the blog, just because I would hate for my boss or a co-worker to find it. I love it! Especially #3 on drinking--made me LOL. Happy Tuesday! LOL Love this! I will be borrowing this post for one of my own! The food one is hilarious. I can totally relate!